The Cline Johnson Shield is actually a combination of two shields. The first is the shield of the Clan Johnston of the border region of southern Scotland. This shield has a black cross of St. Andrew with three golden pillows. The shield, in the language of the heralds, is blazoned Argent, a saltire Sable, on a chief Gules, three cushions Or. For more information on Clan Johnston, please visit http://clanjohnston.org/ and http://www.johnstons.org/clan/clan.html. 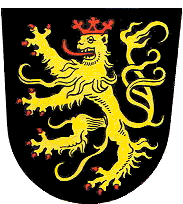 The second is the heraldric lion (a lion rampant Or) which is the ancient symbol of the Palatinate region of Germany where the various Cline families originated. Note that the crown of the lion has been eliminated on the Cline Johnson shield. The full shield in heraldry terms is blazoned Argent, a saltire Sable, a lion rampant Or, on a chief Gules, three cushions Or.